Progressive slot machines, a relatively new invention, are the same as their standard playing cousins, except they have an extra possible prize. A progressive machine is a machine which takes a little bit of the money passed through it, and progressively adds it to a separate prize total. This prize total is added to over and over again until it is won, which doesn't happen very often, so the prize total, or jackpot, can be very large. Progressive slot machines were brought into the market pretty much as a marketing ploy. The psychology behind their incentive is twofold: on one hand they allow the casinos to advertise very large jackpot totals to get people in the doors to the casino, on the other eerily familiar hand, the progressive slot machines allow the casinos to advertise higher payback percentages on their machines, and get even more people in the doors. Now it's easy to see how the casinos can advertise higher jackpots, but why can they advertise higher payback percentages because of the progressive slot machines? Simply put, the casinos are working the progressive win into the expected wins for the machine. This large potential win skews the numbers a great deal. A machine with a large payout on a progressive win can easily have a 97% return rate if you calculate the progressive payout into the expected return percentage. The fact of the matter is though that 99% of the people who play that machine will be paid out at a very crappy percentage, and the 1 lucky guy who wins the jackpot will be paid at an astronomically high percentage, the two percentages just happen to even out to 97%. 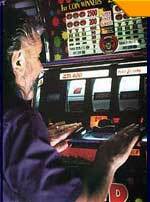 There are two types of progressive slot machines that you're likely to run across in the casino. More specifically there are two types of progressive slot machine networks in the casino. A progressive slot machine is either part of a casinos own proprietary Local Area Network of progressive machines, or the machine is part of a Wide Area Network of progressive machines. The former, smaller, local area networks, are owned and operated by the casino owners themselves. The Wide Area Networks are owned independently by larger corporations who have, well, even more money than the casinos. The local area networks usually cover a small number of machines within one casino, perhaps spanning two or three nearby casinos in total. The wide area networks span not just local casinos, but often right across the country. Companies like IGT offer progressive totals that are contributed to by machines from all over the country, from Las Vegas to Atlantic City. Local area networks of progressive machines have smaller jackpots, and are only contributed to by the lesser number of machines found within the actual casinos. The casino owners run these small progressives themselves because they get to take a larger cut of the profits than on the wide area network machines. Wide area network machines can be found in many, many casinos across the country, but why do the casino owners let them in? The casinos don't own them, and don't get all of the profit (not something Las Vegas casinos usually take kind to), so why let them in at all? Likely the answer to that questions is, because if we didn't let them in, somebody else would. And that somebody else would now have the immense marketing power of being able to advertise multi-million dollar, single-pull, life altering jackpots to its slots players. Don't underestimate the power of this advertising potential. Slots are the most common form of gambling in the world for a reason, people want the American dream: being handed more money than you know what to do with for no effort whatsoever. So which progressive slot machine should you choose? That's really up to you. If you want the life-altering jackpot, like so many of us do, you best stick to the wide area huge progressives. If you want a better shot at winning, the smaller casino-specific progressive slot machines have much better odds, but the jackpots wont change your life forever, maybe just for a year or two. �Copyright Mastering Progressive Slots 2019.